This bear appears to be performing a remarkable act of kindness. 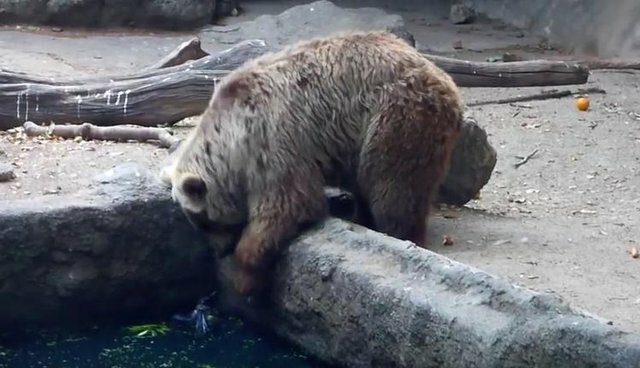 A video taken in 2014 at Hungary's Budapest Zoo shows a curious brown bear saving a very frightened crow who fell into his pool. When the clip opens the bird is already quite waterlogged, desperately flapping his wings as he tries to escape the water. The bear seems to be watching him, and lumbers over when the tired bird collapses in a corner of the tank. He dips his paw into the tank and grabs hold of the sopping bird, in what appears to be a gentle-for-a-bear sort of way. Nipping the bird's wing in his teeth, he pulls the stunned animal out and dumps him by the side of the water. Apparently satisfied, the bear then turns back to eating his carrots. Unfortunately, it's not clear what happened to the crow, as several commenters noted that his wing could have been broken by the bear's rescue efforts. Other people have also questioned whether the bear was actually trying to save the bird, and the zoo itself said that he was just curious and wanted to get a closer look. But it wouldn't be the first time an animal has shown interspecies kindness - just this past June, a hippo was spotted saving a little duckling who fell into her pool.